Double wrap two sushi mats in cling film to prevent the rice sticking. 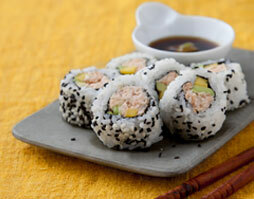 Prepare a small bowl of water and a clean damp cloth – you’ll need these while you’re sushi-rolling. Cook and season the rice as per the heading below “How to cook and season sushi rice”. Lay half a sheet of nori on a sushi mat, shiny side down and with the lines in the nori running vertical. Place one quarter of the sushi rice on the nori. Use lightly moistened fingertips to gently spread the rice evenly over the nori sheet, and then sprinkle over the sesame seeds. Place the second sushi mat over the rice and press firmly but gently to secure the rice onto the nori sheet. Flip the sushi mats around so the mat originally facing up is now facing down and remove the top mat. The rice should be facing down and the nori facing up. Set aside while you prepare the fillings. In a small bowl mix together the poached trout, mayonnaise and wasabi. Peel the avocado, cut into strips and drizzle over some lemon juice to avoid them browning. Place the ingredients in a straight line on the nori sheet. Hold the nearest end of the mat with your index fingers and thumbs. Use the rest of your fingers to hold the ingredients in place. Roll the mat forward to bring the nori and rice wrap around the fillings. Press down firmly but gently to create a roll shape. To finish the complete roll, pull the end of the mat with one hand and continue to push the roll forward with the other hand (if some ingredients fall out the sides simply push them back in and don’t worry if the edges of the roll look untidy). Wrap the mat around the sushi roll to form a secure roll shape. Detach the cling film from the mat and wrap around the roll to secure it when cutting. Transfer the cling-wrapped roll to a chopping board and cut in half with a sharp knife. Wipe the knife clean with a damp cloth and continue to halve each piece. Remove any remaining cling film before transferring to a serving plate. Serve with pickled ginger, wasabi and soy sauce. Place the 2 cups of Japanese white rice in a medium sized bowl, cover with cold water and gently rub the rice grains against each other. Drain the rice, add more water and repeat two or three times until the water runs almost clear. Transfer the washed rice to a heavy based saucepan. Add two cups of cold water, cover and bring to the boil over a high heat. Reduce the heat and continue to cook, covered, for about 10 minutes. Without lifting the lid, remove from the heat and set aside, for another 10 minutes to cook in its steam. Combine the rice vinegar and sugar in a non-aluminum saucepan and dissolve over a medium heat, Stir in the salt, take off the heat and allow to cool. Transfer the cooked rice to a shallow non-metallic baking tray. Sprinkle evenly with the sushi rice seasoning and use a rice spatula to gently fold the rice, taking care not to break the grains. Using a fan or a piece of cardboard, fan the rice to cool it to room temperature and absorb the excess sushi rice seasoning. Use the seasoned rice as soon as possible. Cover with a damp cloth if you’re not using it immediately and store in a cool place. Photo taken by Harry Weir photography as part of a Food & Wine photo shoot with Fiona Uyema.